The grass is always greener on the other side of the fence…at least that is what everyone says. I must admit, I have been guilty of this too, more often than I am willing to say. You only have to peek into my Twitter feed* to see me trying to make deals with the Western world to “send me some snow” in exchange for the sunshine I am so blessed with, but which can also be unrelentingly scorching. So I have decided to stop and appreciate what is naturally mine on this little group of islands: brilliant beaches, gorgeous sunny days, fabulous produce, the luxury of tank tops and flip-flops all year round. As if reading my good-intentioned thoughts, today arrived charmingly sunny yet breezy – all sun-kissed blue sky and the gentle caress of the wind. The weather dreams are made of. To celebrate the advent of sunny days (chasing the clouds away) I am posting another local salad. I’ve mentioned before, I love my native Filipino salads and I hope to share some here. They are uncomplicated and fresh, with piquant personalities…and they go perfectly with our weather! – Clean your lato very gently so as not to pop the bulbs. – Arrange on a plate with tomatoes and onions. – Serve with dressing (see below) on the side. A note on the dressing: The choices for dressing this salad are relatively simple. You can choose to have it with just some vinegar or soy sauce or a combination of both. Some Filipino cookbooks prescribe a vinaigrette of olive oil, vinegar, pepper, and salt. We like a mix of vinegar with just a smidgen of soy sauce and freshly cracked black pepper. Easy on the salt because the lato is already naturally salty. What’s important is to have the dressing on the side as the vinegar will make the lato mushy. You can either dress your salad right before you eat it, or even better, dip the lato directly into the dressing as you eat. Lato is a bright green seaweed, consisting of little bulbs, that I was introduced to by C’s family in Zamboanga. According to his godmother, it cannot grow in water that is not clean, so you know that where lato grows, the sea is clean. When I visited, I ate it straight out of the sea! What makes it delicious is the combination of the feel of the bulbs popping in your mouth, and the salty liquid they release when they do. This is another great example of a Filipino salad – simple elements combined with minimal fuss, letting the delicious flavors shine through. Not only is it fitting for this weather, it gets on famously with summer food like grilled fish. So now I sit at my desk with the windows open, relishing the breeze and the good food that I plan to make with the coming summer’s bounty, happy in the belief that, at this moment at least, the grass in greener right here. I've never eaten seaweed – of any type, but this looks really fun and I love the idea that it only grows in clean water. Alas, being in the middle of cow country, I don't see the chance anytime soon. I'll send you some rain if you send some sunshine! I've only had this a couple of times. Sooooo yum. Where do you buy it? it's been ages since i've have lato salad! and like Rone, wondering where we can buy this? I L-O-V-E lato and this salad is the one mainstay that I insist on having with my inihaw na bangus. This is the stuff of my childhood – Sunday lunch of fish my dad grills and the salad my mom prepares, all eaten from banana leaves taken from our backyard. In our home, we dress this with: vinegar, a splash of bagoong isda (either from Pangasinan or Balayan, Batangas), and a bit of cracked black pepper. A delicious taste of the sea! What a unique salad! I can't wait to try this out! Lato salad is a tasty, healthy, and unusually pretty alternative for any number of side dishes – especially if you're having grilled seafood for dinner~! Hi Katie! It is really interesting and delicious! This one pops in your mouth just like caviar 🙂 Do you know when it gets so hot here I actually welcome the rain because it cools everything down…so I may just take you up on that! Hi Paula! Glad this piqued your interest! Hi Stargazer! It’s the best with grilled fish no? 🙂 Bagoong Balayan and vinegar sounds like a great way to dress this salad…thanks for the tip! Hi Midge! The best with grilled seafood! 🙂 And yes, forgot all about how healthy it is! I'm a huge fan of seaweed so this is right up my alley! Hi Chef D! Yes…love it too! You are right that they hardly need and dressing at all! Hi Joanie! Hope you can find this! They eat this in Zamboanga too…can you imagine? Opposite ends! this is a refreshing salad. I never had this while I was there in the Philippines. I wonder if it's the same seaweed that we have here… if that's the case, I love it… we put a little sugar and sesame oil for a hint of "asian" dressing. Jo, for sure your grass is ever-green! This seaweed looks AMASING! Would that "leaves" pop when we chew? Ooo that is just not fair talking of sunshine and beaches and basically the stuff we don't even really get in summer! 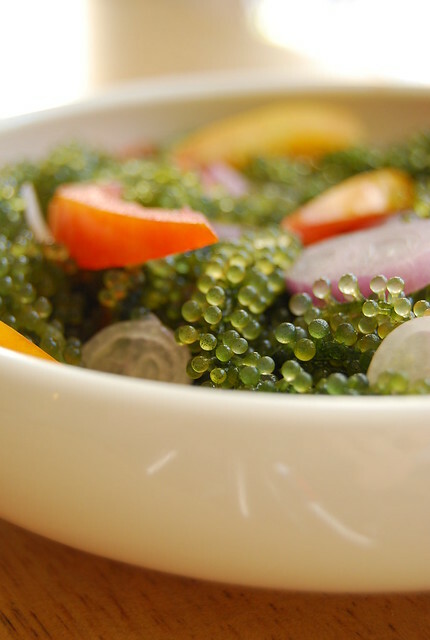 lol… Your seaweed salad looks totally amazing! omg the seaweed looks so vibrant! Hi Malou! Yes, definitely better to be grateful for what one has…there is beauty and magic everywhere, we just have to open our eyes! When we are busy looking over the fence sometimes we miss the great things that are nearby 🙂 That Asian style dressing sounds perfect…I will try that next time! Hi Iyor! How fun! Tiff and I were just talking about diving…I’m afraid I’ll never be brave enough! are those little green bubble like stuff a kind of seaweed? (pardon my ignorance). I wonder were can i find that here in Macau, would love to give a try to this ensaladang! I have never thought to eat seaweed this way. Now the next time I go to the beach I'm gonna look a little more carefully …. Hi Heidi! Yes, they are a type of seaweed 🙂 Very yummy and also very healthy! Hi Wizzy! Heehee 🙂 Over here it is commonly eaten this way, in a salad.